Charles Avery was a guest of Outset Bialik Residency during July 2017. During his residency, Avery worked on ArtBus, a community outreach project at the Petach Tikva Museum of Art. The ArtBus is an innovative communal-educational project initiated by the Petach Tikva Museum of Art, aimed at bringing families to the museum for an enriching and bonding experience. The project introduces young families with children to contemporary art via art education and special activities at the museum. 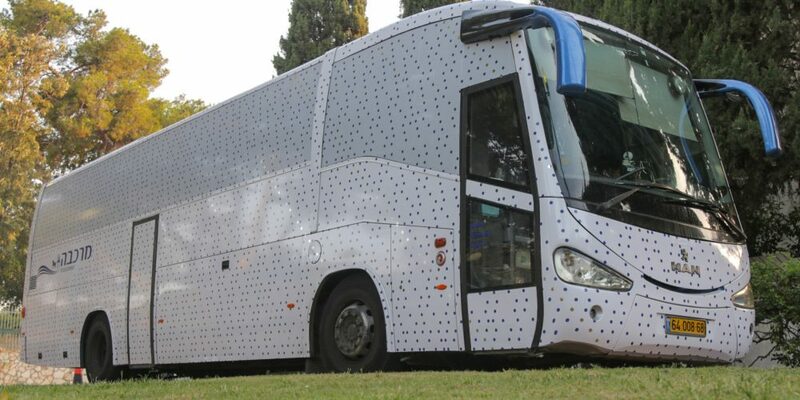 The museum collaborates with neighborhood associations around the city of Petach Tikva in order to bring families with the ArtBus – a travelling piece of art commissioned to the artist Charles Avery. This project was led by Drorit Gur Arie, Director and Chief Curator of the Museum, the museum staff, and Mr. Hezie Lavi. ArtBus was made possible due to the generous support of Outset, UK, BFAMI and an anonymous donation. The PTMA has commissioned UK-based artist Charles Avery to create a unique ArtBus, which will serve as a travelling piece of art and will be used to transport children and their families to the Museum. This activity encourages participants to think of art not only in the context of the museum, but rather as an inspiration to all fields of life. The unique design of the bus draws from Avery’s book “Onomatopoeia.” It includes a bold, abstract geometric pattern of aquamarine blue dots set against a white background, which will envelop and cover the entire bus. The pattern is a direct extension of Avery’s drawings and objects, which provide viewers with clues to an imaginary hunter wondering in mythical netherworld, a world of dreams, intuition, and imagination, drawn from everyday life as well as from the artist’s personal biography, which is then combined with both art historical and mythological references. For the PTMA project, Avery created an extension of the story linking it to the museum, with the story starting on the imaginary island, moving on to the ArtBus with the children and families and ending the search at the PetachTikva Museum of Art. Born in 1973 on the Isle of Mull, Scotland, Charles Avery lives and works in London. Since 2004, Avery has exclusively devoted his practice to his epic project “The Islanders.” Through drawings, paintings, sculptures, and texts, Avery tells the story of a fictional island with its own inhabitants, culture, religion, nature, and architecture. Avery’s work has been exhibited in museums in the UK and around the world, including the Tate Museum (London), RISD Museum (Providence), Seattle Museum of Art (Seattle), Centro per l’ArteContemporanea (Florence) and more. Avery also represented Scotland at the 52nd Venice Biennale in 2007. He won the Prospects Drawing Prize, London, in 2003, and his works are in the collections of Daniel and Florence Guerlain and the Prints and Drawings Department at the Mnam-Centre Pompidou, Paris. Since its reopening in 2004, the Petach Tikva Museum of Art, led by Drorit Gur Arie, Director and Chief Curator of the Museum, has become an influential institute in the Israeli art scene and a lodestone for local and international art lovers. In addition to engagement with universal themes pertaining to life today, it poses an alternative to the large museums via exhibitions that address the local cultural space and the geopolitical setting. While promoting an interdisciplinary critical discourse, the Museum serves as a platform for young artists whose artistic language reflects a different gaze in an original voice.